Stromal vascular fraction skin treatment is a type of stem cell therapy based on isolation of adipose tissue during liposuction or lipo-aspiration procedures of patient’s own body. In stromal vascular fraction treatment isolation of tissue contains fat cells, blood cells, and endothelial cells, as well as a large fraction of adipose-derived mesenchymal stem cells which provides regenerative properties and have positive anti-aging properties. A stromal vascular fraction is considered as a personalized stem cell therapy and effective tropical or injectable treatment. With increasing age, regenerative and repair properties of skin are less effective due to decrease in stem cell count, and therefore, stromal vascular fraction treatment contains stem cell provides a boost in repair and maintenance mechanism of the skin leaving smooth, healthy, radiant skin. Stromal vascular fraction is a naturally occurring stem cell found in bundles of adipose tissues and are the primary source of growth factors along with macrophages and other cells. Due to the presence of growth factors, the stromal vascular fraction is utilized to decrease inflammation present in many diseases. A stromal vascular fraction is adopted in the treatment of rheumatoid arthritis, joint replacement, osteoarthritis, diabetes, Crohn's disease, and others. Stromal vascular fraction is a combination of adipose-derived stromal cells (ADSCs), endothelial cells (ECs), endothelial precursor cells (EPCs), smooth muscle cells, macrophages, pericytes, and pre-adipocytes in the aqueous state. Stromal vascular fraction is advantageous over alternative medical treatments as SVF has the ability to regulate patient’s own system with the main focus on cell repair and regulation of defective cells. Stromal vascular fraction is a promising field for disease prophylaxis and currently are in clinical trials. The global stromal vascular fraction market can be segmented on the basis of type of therapy, end-user, and region. In its last part, the report offers insights on the key players competing in the global market for stromal vascular fraction. With detailed profiling of each of the key companies active on the competitive landscape, the report provides information about their current financial scenario, revenue share at a global level, development strategies, and future plans for expansion. Strategic collaborations, mergers, and acquisitions have also been considered as a key strategy among a majority of leading companies in the market. 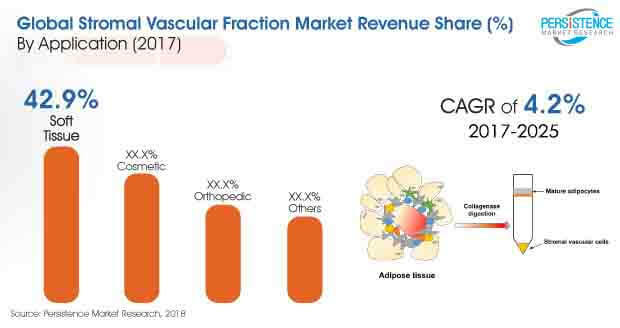 The global stromal vascular fraction market has been projected to witness moderate growth over an eight-year forecast period, as explained by a recent research report on the global market for stromal vascular fraction. According to the report, the market will possibly reach US$ 102 Mn by the end of 2025, up from US$ 73 Mn valuated in the year 2017. The global market CAGR estimated for the assessment period 2017-2025 is 4.2%. The market for stromal vascular fraction is currently in its nascent stage, and awaits the establishment of the safety and efficacy of SVF devices. Being a controversial segment of the regenerative medicine, the stromal vascular fraction market will continue to face strong debates among lawmakers, regulators, and clinical practitioners. This has been a key factor associated with the uncertainty of safety, quality, and efficacy of the data that eventually hampers adoption rate of SVF therapies and devices used during the process of stromal vascular fraction therapy. As per the report indicates, the market is currently witnessing widening adoption of the PoC (point-of-care) devices, attributed to a relatively higher convenience level associated with their use. A rapid shift towards value-based model of healthcare delivery and considerably growing healthcare expenditure worldwide will remain the significant drivers to market growth. A few recent trends have been observed to fuel market growth, including successful development of PoC devices, inclination towards higher convenience and cost-efficiency over traditional fat-grafting therapies, clinical success of innovative adipose –derived SVF therapies, and an overall better therapeutic outcome. Moreover, the market is expected to benefit from a massive pipeline of a wide range of SVF-derived cell therapies. By the application of stromal vascular fraction therapies, the market is anticipated to witness continued dominance of soft-tissue segment. Soft tissue applications include post-mastectomy breast reconstruction, cosmetic breast augmentation, sports injuries, burn and trauma injuries, scleroderma, and DFU (diabetic foot ulcer). Among these, breast reconstruction and DFU seem to account for major revenue shares in the market over 2017-2025. Cosmetic applications are identified to represent a rapidly expanding segment, as the industry has been witnessing rapidly surging demand for aesthetic and reconstructive therapies since the past decade, such as facial restructuring, deformity correction, facial scar and, facial atrophy, lipoatrophy, aging, wrinkles, wounded warrior/limb shortening/amputation, facial fat grafting, cosmetic surgery, and alopecia. Orthopedic applications are also slated to increase between 2017 and 2025, as per the report forecasts. Among the key regional markets for stromal vascular fraction therapies, North America will reportedly continue to capture a dominant share in terms of value. However, Asia Pacific and Europe are also estimated to be the key markets throughout the forecast period. According to the report, APAC is projected to witness a CAGR value higher than North America and Europe, whereas the South Korean market for SVF therapies is slated to experience the fastest growth during the assessment period, resulting in the fastest CAGR value in the global stromal vascular fraction market.